For the Ibiza nightclub, see Space (Ibiza nightclub). 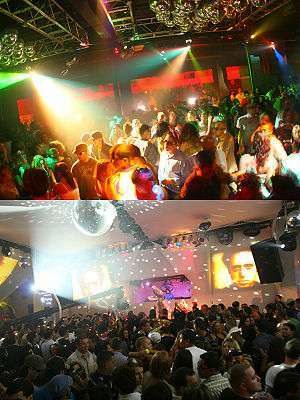 Club Space is a large nightclub located in the downtown area of Miami, Florida, owned by Justin Levine and Roman Jones. In the fifteen years of operation, Space has resided in two buildings. The first was a renovated one-story warehouse consisting of three rooms as well as an outdoor patio area, which was one of the primary reasons the venue was made famous. From March 2000, to April 2003, Club Space played host to some innovative parties for the Miami dance music scene, including marathon sets from Danny Tenaglia and Paul Van Dyk. Noted Miami producer Oscar G also acquired his long-running residency at this building. Due to capacity issues, the venue was then moved to a larger warehouse and briefly renamed Space 34 before returning to its old name. In its current configuration, (the building has radically changed its layout many times) Space is a 3-room, 25,000-square-foot (2,300 m2) complex, consisting of a large main room with a significant VIP area, an upstairs loft, as well as a rooftop patio which plays host to daytime parties. Often, guest DJs will play the main room and then continue their sets upstairs on the patio.